Thor: The Dark World, as with the other Marvel Avengers films, picks up the thread of its story a few years after the Battle of New York. One of the strengths of Thor as a character, is that he is not restricted to an Earth bound story but instead, the canvas of any Thor driven story has the vastness of Nine (whole) Realms in which to explore and utilise. 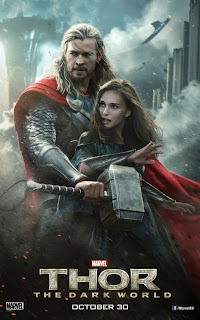 Co-screenwriters Christopher Markus and Stephen McFeely, well versed in the Marvel universe from Captain America: The First Avenger, 2011 make references to events on Earth but the world of Asgard is opened up in all it's baroque grandeur. The Lady Sif (Jaimie Alexander) and the Warriors Three are included in an array of battles with the talents that Thor (Chris Hemsworth) brings to the battle field and as a regal leader on display though gone is Thor's adolescent-like swagger. The hyperbolic setting of the Nine Realms are continuously balanced out by the intimacy of the relationships shared by the main characters. 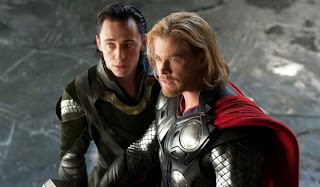 Frigga (Rene Russo) and her particular connection with Loki (Tom Hiddleston) is fleshed out while the solitary nature of what it means to be a king is considered through Odin's (Anthony Hopkins) war time focus all via the MacGuffin of a dark power source the Aether. 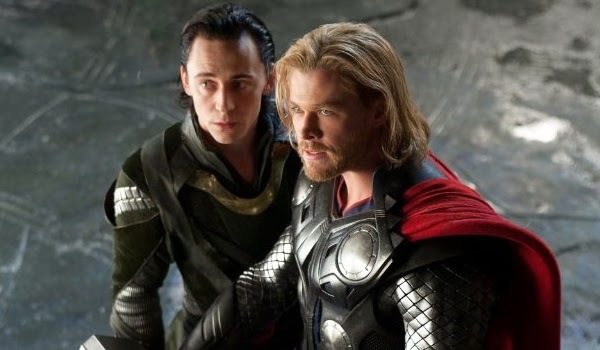 The complexity of fraternal love and hate between Loki and Thor fuels so much of the drama - and at many times humour - in the film as it constantly plays with the mercurial nature of Loki by Hiddleston who continues to steal the show. The 'Shakespeare in the Park' dark intensity of the Asgardian brothers is balanced by the fish out-of-water lightness shared by Jane Foster (Natalie Portman) and Thor. As Thor and Jane's worlds once again collide, the humour of making such a relationship work is mined to great effect. Meeting the parents or staying over take on whole new levels while the on screen chemistry between Hemsworth and Portman allows the audience to root for them no matter the circumstances. Christopher Eccleston as the Dark Elf Malekith is the story's catalyst while being the counter to the light of Asgard as he returns to seek vengeance against it using the Aether. The once in every 5000 year alignment of the realms known as the Convergence makes perfect sense while watching the film as does the Aether when explained. Think the Ring from The Lord of the Rings with Portman being Frodo. Director Alan Taylor completely embraces the silliness of humans dealing with Gods and Monsters with Darcy (Kat Dennings) grounding events with perfect comedic asides and observations. Idris Elba as Heimdall and Stellan Skarsgård as Dr. Erik Selvig are also given more screen time and reiterate the balance within the film as advisors to the main protagonists, one through science and pantless madness, the other through divine-like clear eyed magic and calm. All of the female characters are strong, grounded and seem particularly capable to deal with the complexities found within the story. Thor: The Dark World with a running time of just under two hours is jam packed but still muscularly lean, keeping its finger on the pulse of all that is great about the mighty Thor - humour, drama, family and relationship complexity and satisfyingly astounding action.